Copy ad headings and texts to Microsoft Excel and send them to your client. The client makes corrections and sends the file back. You insert the corrected ads to Direct Commander. Copy sitelinks addresses from the SL1 Address column to the SL2 Address column, and then enter corrections (for example, by using search and replace). Copying and inserting columns' content is available for every tab where data is presented in the form of a table: Campaigns, Ad groups (in table mode), Ads (in table mode) and Keywords. To select columns, right-click on its header and select Select column in the context menu. If you need to select several columns, you must subsequently select each of them. Select the columns that must be copied. Right-click on the header of any of the selected columns and select Insert columns in the context menu. The selected columns' content is copied to the clipboard, after which you can insert it to the electronic table, text editor, or instant messaging program. A data array from several rows and columns can be inserted to Direct Commander. The data array can be copied from Direct Commander, an electronic table, or text editor (in the latter case, the cells inside a row should be separated by tab characters). The data can only be inserted in columns that can be edited. For example, if inserting the array presented above in the Ads tab starting with the column Number, then the data will be inserted to the columns Header, Text, and Link. The non-editable columns Number, Status, and Moderation will be skipped. Before inserting, the columns where the data will be inserted can be selected. If there are no selected columns, the data is inserted in sequential columns. If there are more rows in the clipboard than in the table in the Direct Commander tab, then new rows will be added to the table. Exception: if groups from several campaigns or ads/keywords from several groups are displayed in the table when selecting multiple columns/rows, new rows will not be created in the table and the “extra” rows from the clipboard will be ignored. Empty rows at the end of the inserted data array are ignored. Empty rows or cells at the beginning and middle of the array clear the corresponding cells in the table (or new empty cells are created for them, see the previous point). If necessary, change the columns' order in the Direct Commander tab by dragging the headers with your mouse. Select the columns where the data will be inserted. Right-click on the header of any column and select Insert columns in the context menu. The data will be inserted to the selected columns (except non-editable ones). 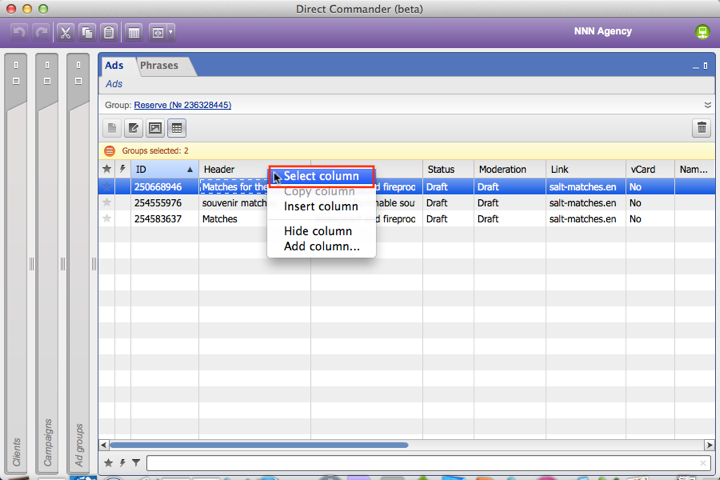 If necessary, change the columns' order in the Direct Commander tab by dragging the headers with your mouse. Make sure that there are no selected columns. Right-click on the column's header starting with the one where the data should be inserted. Select Insert columns in the context menu. The data will be inserted into all editable columns starting with the one whose header you clicked. Tip. If you need to insert data into several tabs at once (for example, ads and keywords), it's easier to use the import function.